Oxfam presents a new research paper that provides an overview of the current status of the patenting of plants in developing countries and emerging economies. To feed a growing world population and optimally adapt to the challenges of climate change, all farmers and breeders need unrestricted access to the building blocks of life. Oxfam is concerned that the growing number and scope of patents on plants, plant parts and DNA sequences will threaten food and nutrition security by blocking the free availability of these materials for further breeding and re-planting by all stakeholders. Over the last few decades, the number of patents on plants and plant parts has greatly increased in various parts of the world. Most research into the spread of plant patents, however, has focused exclusively on developed countries – the USA and European Union, in particular – while little is known about the extent to which plants are being patented in other parts of the world. 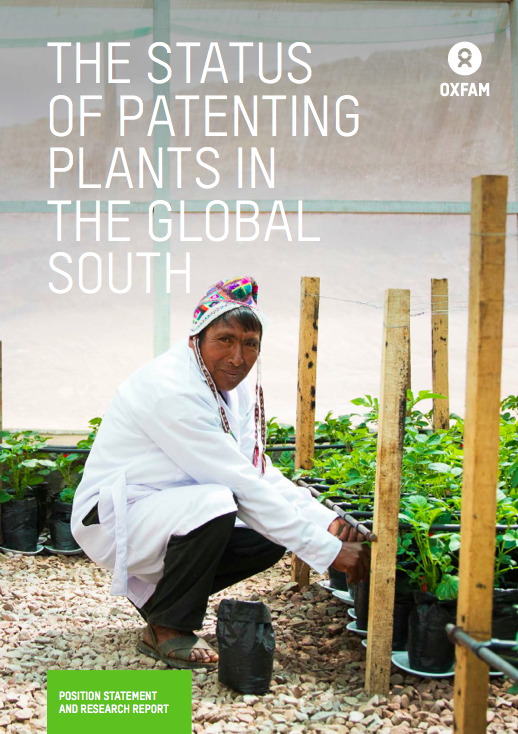 This research report aims to fill this information gap by providing an overview of the status of patenting plants in the developing countries and emerging economies of the Global South. The research, conducted by Professor Carlos M. Correa, is based on the analysis of legal provisions, patentability guidelines, court decisions (where they exist) and a sample of patents granted in the countries selected for this study. The findings indicate that despite the flexibilities of the WTO TRIPS Agreement regarding the non-patentability of plants, 60% of the 126 countries in the Global South for which data was available allow for the patenting of plants or parts thereof, and in the jurisdictions involved many such patents were identified. With this research report, Oxfam aims to contribute to awareness and understanding of the extent to which plants are being patented in developing countries in order to inform societal discussion and decision-making. As part of its efforts to promote an enabling policy environment for farmers’ seed systems and the implementation of Farmers’ Rights, Oxfam will continue to monitor patent trends in the Global South and assist stakeholders to raise awareness about the impacts, organize advocacy and take remedial actions where and when needed.